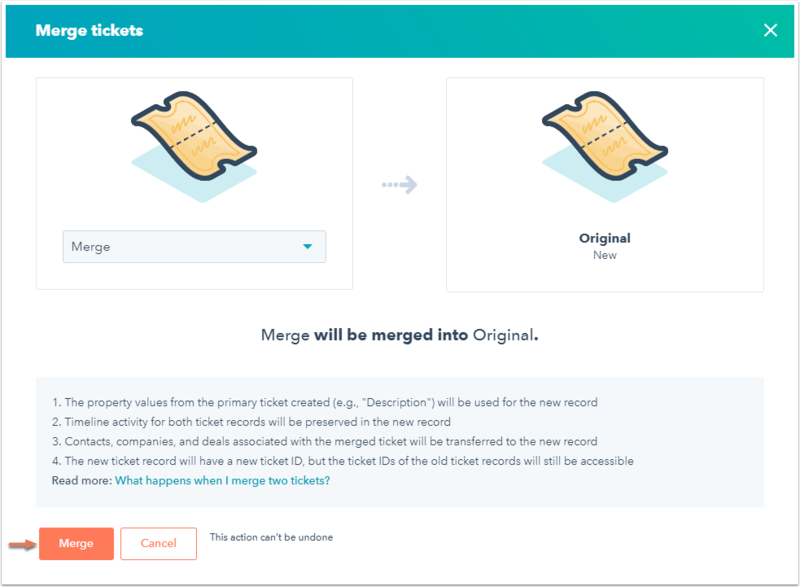 Merge two ticket records into one record. 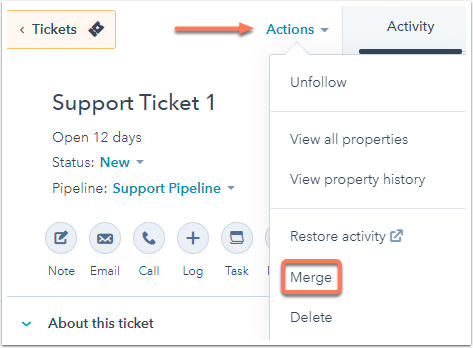 If you wish to merge tickets, it is important to understand what will happen to the data on the ticket records you are merging. What happens when I merge two tickets? In your HubSpot account, navigate to Service > Tickets. Click the ticket name that will be the primary ticket record. On the upper left, click the Actions dropdown menu and select Merge. Search for the ticket you want to merge into the primary ticket. Once you've selected your secondary ticket, click Merge. You will be notified that the merge is in progress. It can take up to 30 minutes for all of the ticket activities to sync. A new ticket record will be created as a result of the two merged tickets. The engagements on their timelines will be merged. What happens to ticket properties? Create Date: the value for the oldest ticket is maintained. Ticket id: the resulting ticket will have a new value that is different from the primary and secondary tickets. Status: the resulting ticket will adopt the status of the primary ticket. Priority: the resulting ticket will adopt the higher priority. For example, when a Low priority ticket is merged with a High priority ticket, the resulting ticket will have a High priority. The secondary ticket will be unenrolled from all workflows. The resulting ticket will not be enrolled in the workflows that the primary and secondary tickets were enrolled in. The resulting ticket will also not be enrolled in any new workflows, even if its new property values matches any enrollment triggers at the point of the merge. What happens to associated objects? Any associated objects will be associated with the resulting ticket.